An old saying in the industry says: fund management is risk management. The global risks that need to be managed have changed noticeably and objectively in recent years. Political and social risks are increasingly outshining traditional economic risks such as escalating inflation or deflation, bubble formation on the financial markets, national bankruptcy or a major financial crisis. Moreover, we are discussing the changed risk landscape and how to deal with it also in the context of our company. In most cases, this discussion is conducted using a risk matrix in which potential risks are defined and then evaluated according to their presumed impact, e.g. on the stock markets, and their probability of occurrence. This approach is not particularly original, but it allows us to see very quickly what counts and what does not. We are not alone with this approach. At the beginning of each year, the global decision-makers meet in Davos, Switzerland, for a few days and do the same. 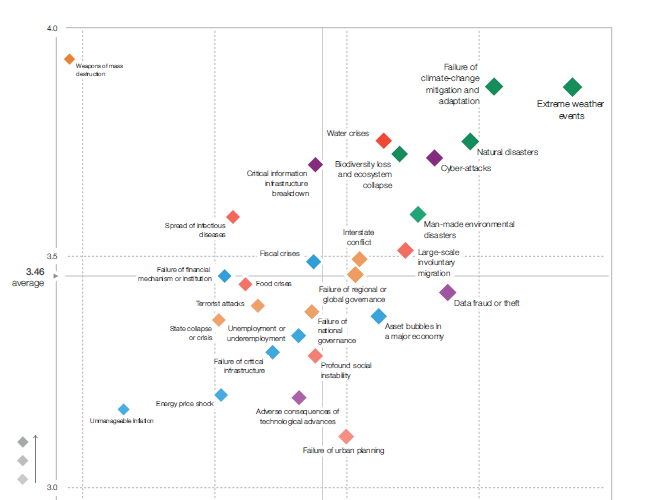 They assess the risks that they consider to be significant worldwide in terms of impact and probability of occurrence and publish the results in the World Economic Forum Global Risk Report. The report lists the top fears of the global elite in the categories of economic, geopolitical, social, technological and environmental risks. The results are exciting and surprising because the most important risks are environmental risks. The economic risks stop before the environmental risks even begin. And this assessment does not come from the pen of a few overly eco-oriented tree huggers, but directly from the heart and brain of global capitalism. You probably know the joke about the ghost driver warning on the radio: A car driver hears the message and wonders why the warning mentions only one ghost driver, even though there are so many coming towards him. A few years ago, a sustainable asset manager was seen as a ghost driver on the economic highway. In the meantime, ESG risks have entered the heart of capitalism. Based on Sartre: The ghost drivers are now the others. In this ESG Letter, we want to address this change in risk assessment, report on the biggest risks worldwide and show how a sustainable asset manager can deal with them and even earn some money. Have fun reading our articles on global risk! Gerold Permoser has been Chief Investment Officer at Erste Asset Management since early April 2013. He is responsible for all asset management activities and investment strategies for all investment funds held by the Erste Asset Management Group in Austria, Germany, Croatia, Romania, Slovakia, the Czech Republic, and Hungary. Before joining the company, he served this function at Macquarie Investment Management Austria KAG. Permoser has gathered experience in investments since 1997. He began his career as a fixed-income analyst at the Creditanstalt in Vienna. He moved to asset management at Innovest KAG in 2000. He made significant contributions in the investment field there and advanced to CIO (director of asset allocation and research). Gerold Permoser studied at the University of Innsbruck and is a CFA charter holder. He offers training at the University of Vienna and at various post-graduate institutions for analysts and portfolio managers (i.e., at VÖIG, the Association of Austrian Investment Fund Companies).